Each Signicade Frame order includes 2 signs and one frame. 1 sided will include two signs printed on 1 side - 2-Sided will include 2 signs printed on both sides. Our Signicade® Deluxe is equipped with a patented Quick-Change™ feature which allows signs to easily slide in and out and also with Stay Tabs™ which ensure signs stay securely in place. Pair this stand up with up to two 24"W x 36"H 4mm Coroplast signs. The Signicade® Deluxe Sidewalk Signs are made out of durable plastic so they are perfect for displaying your signage outdoors. You can also fill the stand with sand to add even more stability. Commonly used for parking, real estate, election and yard signs. 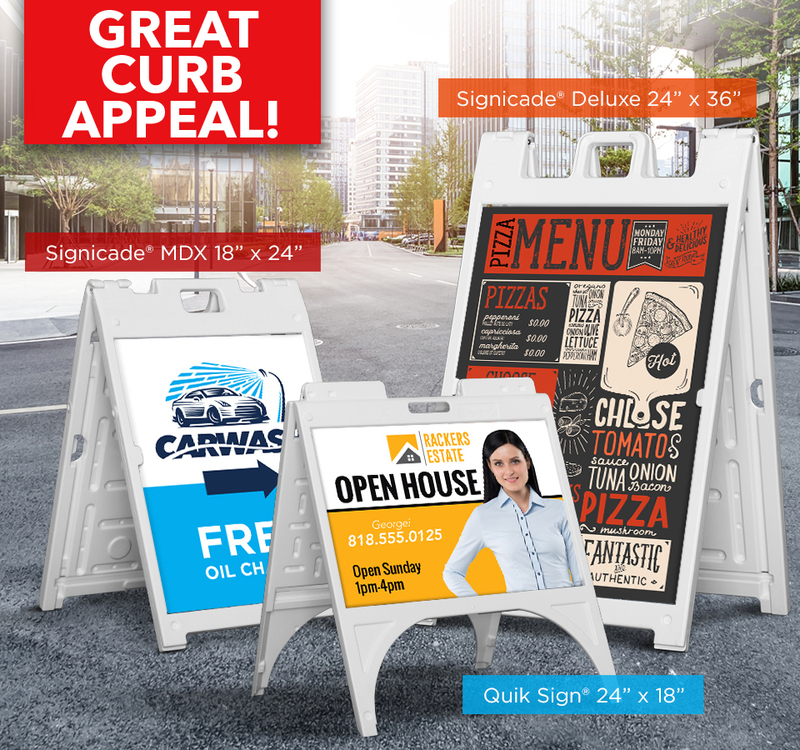 Signicade® MDX is a medium sized version of our Deluxe Sidewalk sign. It is paired with 18"W x 24"H 4mm Coroplast. The Quick-Change™ feature allows your signs to easily slide in and out and Stay Tabs™ ensure signs stay securely in place. The Signicade® MDX Sidewalk Signs are made out of durable plastic so they are perfect for displaying your signage outdoors. You can also fill the stand with sand to add even more stability. The Signicade® MDX is available in white. Common uses are parking, real estate, election and yard signs. Quik Sign® frames hold two 24"W x 18"H signs and are available with 4mm Coroplast. They are equipped with the Quick-Change™ feature for easy installation. The frame is made of plastic making it suitable for outoors use. Quik Sign® frames can also be paired with 24"W Rider signs making them an ideal choice for real estate signage. Add Rider signs to the top of your Quik Sign.